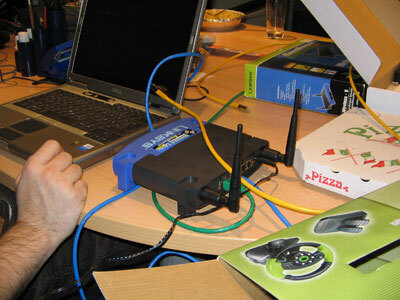 While we had some racing fun Atze was working on the newly modded Linksys WRT54G Wireless LAN Accesspoint. By the way: isn´t this colorful network equipment…i´m sure we would have even red TP cable. Two days ago i received this brand new Speedlink Green Lightning Wheel for testing. And today my mate namenlos messaged me: “Pizza, Office ? 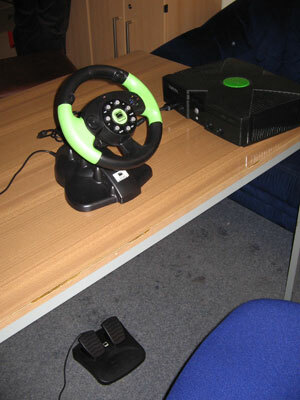 Bring your Xbox!” – and because the Pizza-idea is great so i brought my Xbox and the wheel. In my opinion the wheel has a much better quality than what you normally expect at this pricing-level (~€30,-). It is completely made of black plastic and some green rubber. You got all the Buttons you have on the normal Xbox Controller and some more – for instance the foot pedals. The wheel does not have any force feedback – but it vibrates when the normal controller would vibrate (you can disable that). Finally you can adjust the steering-sensitivity in 3 levels: 30 degree, 60 degree and 90 degree. I’ve tested the wheel with Colin McRae 2005, V8 Racedriver 2 and Burnout 3 with completely different experiences: Colin McRae 2005 was not playable at all – It seemed that the wheel and the game were totally out of sync: When you steer it took the game some seconds to react. Very fungous. 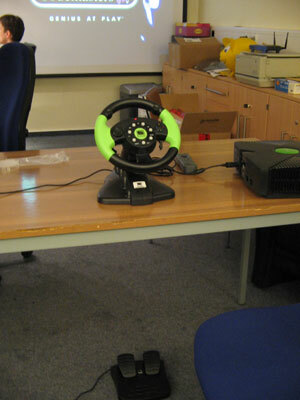 Colin McRae is hard with the normal controller but its unplayable with the wheel. V8 Racedriver 2 was the complete opposite. Out of the box it just worked perfectly. After one hour of testing I was able to achieve the same or even better lap-times than with the normal Xbox controller. I found the highest steering-sensitivity level to be perfect. Burnout 3 was – well playable but far from perfectly playable. It seems that the more arcade-style games are not the best games to play with the Speedlink wheel. The game reacted immediately to steering commands – but at all you have to steer to much to get the car moved around the circuits even when you use the highest sensitivity. Finally some words to the foot-pedal: They do their job – but they could be improved: The next time please make the pedals wider.. i had some problems locating the pedals with my feet in the heat of the battle. So my conclusion: When i drive on the Xbox i normally drive V8 Racedriver. 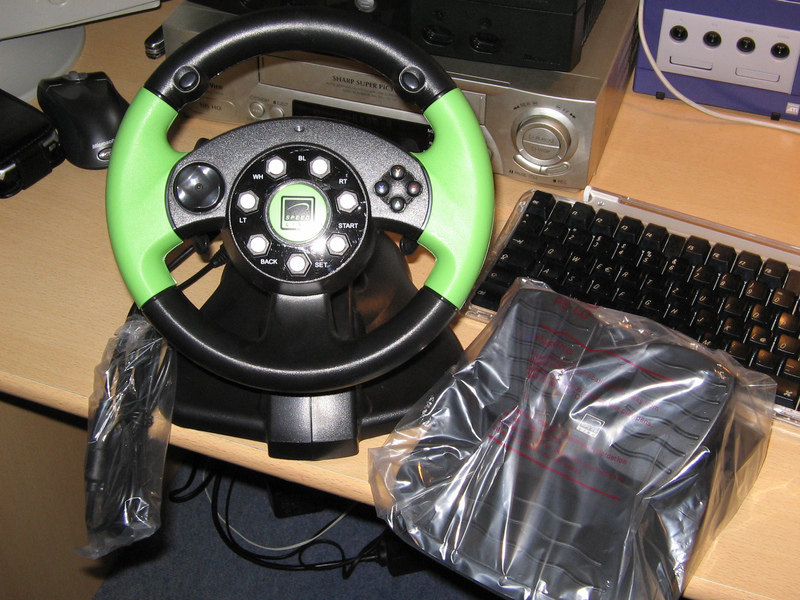 So the wheel works great for me – but its generally useless for any semi-realistic or arcade racing game.